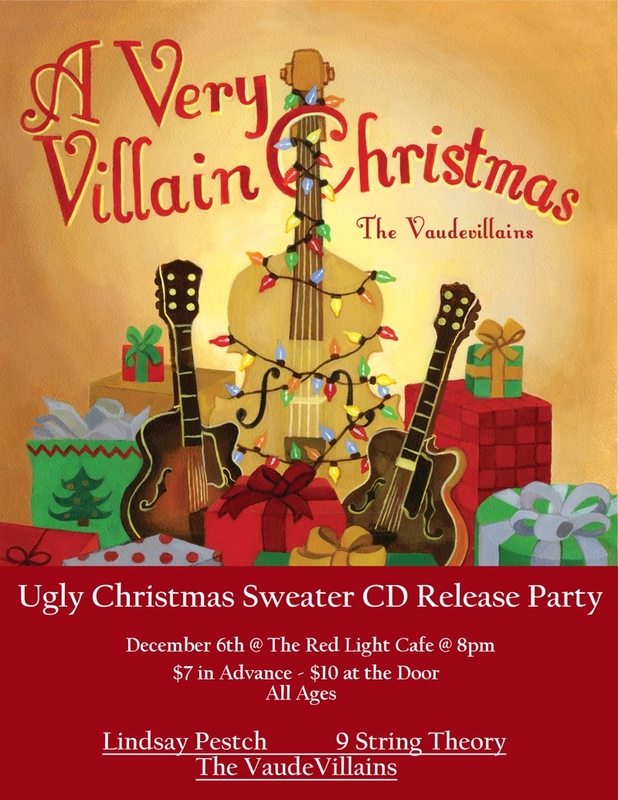 The VaudeVillains will be hosting an "Ugly Christmas Sweater Party" at the Red Light Café in order to ring in their new album, A Very Villain Christmas. What does that mean? The 'Villains have been hard at work putting together an album made up of entirely instrumental holiday songs that they will be releasing on December 6th, 2014 and they’d like everyone to come to the debut wearing a hideous, holiday-themed sweater. Joining them to help celebrate the evening will be the immensely talented acoustic duo 9 String Theory and the ever-enchanting Lindsay Petsch. The night promises to be filled with holiday guitar madness fit for the whole family! Need to get your hands on a sweater for the show? My Ugly Christmas Sweater supplies the world with vintage, up-cycled and brand new Christmas sweaters. Check 'em out! Carrying on the “Travis Picking Tradition,” Cody Jung worked as a sideman in numerous Atlanta bands while putting himself through college. After meeting Kris Anderson, the two guitarists quickly formed The VaudeVillains as a fun weekend project, neither expecting it to go much further than the occasional picking session. Little did they know that the band would begin gaining notoriety for their distinct sound and style amongst guitar aficionados and country music fans alike. The band still consists of Cody Jung, now a 3rd year law student in Atlanta, and Kris Anderson, a highly respected music teacher and graduate of the Atlanta Institute of Music. However, the band is now a trio with the addition of standup bass player Chris Carter. A staple in the Georgia music scene, Carter completes the string trio with his solid bass lines and clever insight into the band’s arrangements. Some of the ‘Villains’ recent accolades include: sharing the stage with some of the world’s most renowned thumbstyle players, including Thom Bresh (son of the great Merle Travis); being featured and performing on radio stations such as: WRFG 89.3FM Sagebrush Boogie, WDVX 89.9FM Blue Plate Special, and WRAS 88.5; being the featured artists in RUST Magazine; and being endorsed artists of Eastman Guitars, Fred Kelly Guitar Picks and Cleartone Guitar Strings. John Huston has distinguished himself as one of the most exciting and expressive guitarists of his generation. Guitart International has praised him as "a formidable talent”, the Fort-Worth Star Telegram described his “considerable energy and impressive virtuosity", and La Stampa has called his playing "...mesmerizing." The accolades for Mr. Huston's performance are numerous, including First Prize in the 2001 Aranjuez Strings International Guitar Competition. John has played concerts throughout the U.S., Canada, and Italy and performs frequently with the Atlanta Opera, the Atlanta Symphony Orchestra, and the Atlanta Balalaika Society. Together as 9 String Theory, Angelina and John create acoustic sounds like nothing you have ever heard. A 9 String Theory concert is like a musical trip around the world, featuring Latin American rhythms, Russian Gypsy fire, Spanish flamenco, echoes of Eastern Europe, and songs from America. Concerts by 9 String Theory delight and excite the most diverse audiences, and their combined virtuosity will win over the most discerning music lovers. 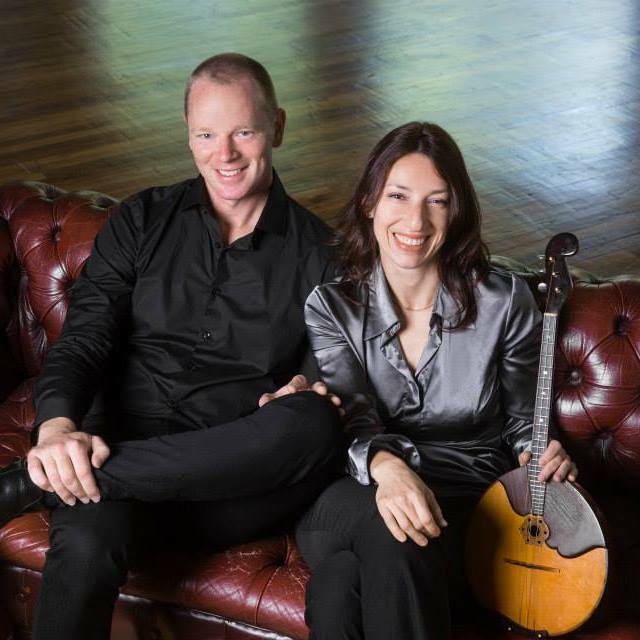 "Angelina and John were peerless in their musicianship. The audience was dumbfounded and captivated by the mastery they displayed… never have I heard any instrumental duo at such a peak of perfection. Everyone in attendance bore witness to the privilege of being present at such a performance and left swearing never to forget the experience. These are truly a special pair!" Lindsay Petsch has literally grown up surrounded by guitars, and he actively enjoys expanding his knowledge of the instrument and sharing that knowledge with others. While maintaining an interest in all types of music, he specializes in acoustic fingerstyle guitar, composing both songs and instrumental music. Apart from his role as manager here at Maple Street Guitars, Lindsay is also active in the Atlanta acoustic music scene. He founded and co-hosts the Tuesday night String Club — a songwriter showcase at the Java Monkey in Decatur — and he performs both publicly and privately. Along with fellow solo guitarists, Jimmy Galloway and Gene Quinn, Lindsay recently released an album of original instrumental music, The White Dog Tracks.